In the cooperation with Cultural Centre Tobacna 001 Ljudmila hosted two worldly acclaimed artist James Powderly and Eun-Jung Son between January 6th till February 26th. Their final work was presented on the exhibition The Lickers, which was set in Gallery Tobacna 001 between February 23rd and April 8th 2012. 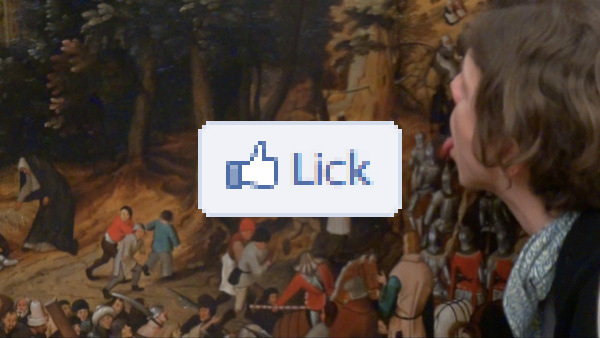 The documentary The Lickers by James Powderly and Eun-Jung Son presents the phenomenon of painting licking. Painting licking is a growing underground scene with a diverse membership including graffiti counterculture, museum cura- tors, activists, and art enthusiasts. They connect challenging aspirations regarding sports, artistic involvement in a reinterpretation of art history, and technological hacking of the surveillance systems of museums and galleries. This highly engaging documentary suggests another form of appreciating artworks, subverting the ocular-centric world view. One of the symbolic functions of licking paintings is the power of nomination. interestingly, the Latin word lingua and the Slovene word jezik can mean either language or tongue, therefore licking a piece of art proclaims the piece as worth licking, talking about, or viewing. The choice of the playful lickers is based on various interests and reasons. Some choose a particular work of art according to its monetary value. coming from graffiti culture, some lickers choose to express their admiration for the artist that inspired their own work, while others prefer a challenge, choosing instead the most well guarded masterpieces. The lickers have been extremely wary of surveillance cameras, sensors, and museum personal, hence this behavior had not been previously recorded. one of the reasons for this is that, much like Fluxus, the lickers do not see the importance of documenting their actions (they often don’t see it as art and they are rarely aware of the larger community of lickers). They attempt to undermine the sanctimonious manner of behavior in museum spaces that often demands silence and ritual behavior. The documentary contains maps, essays, and interviews with the lickers, security guards, art conservators and other professionals sharing their experiences of this highly peculiar behavior. What do the lickers experience when they come into contact with a painting? Why are they exclusively interested only in paintings? The tasting of the painting goes beyond the divisions into particular genre or style. When one licks a painting the known categories must be entirely adjusted to other categories; not just to understand the tastes such as bitter, pungent, spicy, sour, sweet, salty or just bland, but more accurately to interconnect the categories and keywords to produce descriptions like “gripping, sharp, overwhelming” or “silent, bitter, slightly monotonous”. however harmless or malevolent these acts may be for the painting, they produce humorous and poignant revelations regarding the absurdity of the legal and social ideas of ownership, originality, and property rights. Artists’ talk and presentation of the exhibition project. Guided tour by Ida Hiršenfelder and artists’ talk. Guided tour by Alenka Trebušak. James Powderly is a designer and educator working in the fields of open-source, creative technology design, aerospace robotics, tattoos, rock'n'roll, education and media art since 1996. His art and design work has been exhibited on six continents and he has two artworks in the permanent collection of the MoMA in NYC. His first feature-film premiered at the Film Festival in 2008. He has participated in numerous international residencies and fellowships with organizations like the Eyebeam OpenLab and the Gyeonggi Creation Center, and won numerous awards, including the Design of the Year in Interactive Art from the Design Museum, London, the Golden Nica and Award of Distinction from Ars Electronica, the Swiss Art Award at Art Basel, the Future Everything Award and the Excellence Prize from the Japan New Media Art Festival. James is the co-founder of both the award-winning Graffiti Research Lab and the international, open-source art pioneers, The Free Art and Technology Lab. He was also part of the team that created and operated the Mars Exploration Rover and the Phoenix Lander for NASA. James worked as an adjunct professor at Parsons The New School for Design and is currently an Assistant Professor at Hongik University. Time Magazine included James on their list of the “Top 10 Guerilla Artists” of all time. James currently lives in Seoul, South Korea and has started his own design studio, called Nasa Factory. Eun-Jung Son has been involved in educating young people since 2006. She has a degree in Visual Communication Design from Soongeui Women’s College and a degree in Education fromKorea University. She has taught young people, including children with Autism and Asperger Syndrome, and conducted educational workshops in Korea, Malaysia and Africa. She is the founder of an internationally-renowned, innovative education program, called Dream Move, that combines technology, creativity and physical education. She is the CEO and co-founder of NASA Factory, a design studio based in Seoul. Nasa Factory, which translates to “screw factory” in Korean, is an art and design R&D studio based in Seoul, South Korea that specializes in new media technology, design services and original equipment manufacturing for the arts, entertainment and commercial industries. Nasa Factory was co-founded in 2011 by James Powderly and EJ Son. Tobačna Ljubljana has supported the entire Galerija 001's programme in 2012.